Michael and Anne Blaney and their son Colm, of Thornhill, ON, were the big winners of the $15,000 Family Camping Package at the Toronto Spring Camping & RV Show and Sale. Left – Right: Shane Devenish, Executive Director, CRVA, Shannon O’Callaghan, Show Manager, Michael Blaney, Colm Blaney, Peter Hornov, Owner, McKenzie RV Trailers. Michael and Anne Blaney and their son Colm, of Thornhill, ON, were the big winners of the $15,000 Family Camping Package at the Toronto Spring Camping & RV Show and Sale. Left – Right: Shane Devenish, Executive Director, CRVA, Shannon O’Callaghan, Show Manager, Michael Blaney, Colm Blaney, Peter Hornov, Owner, McKenzie RV Trailers. In February 2016, the Blaney family of Thornhill, Ontario, attended the Toronto Spring Camping & RV Show to shop for their first RV. Michael was one of more than 3,000 people who filled out a ballot for the show’s grand prize camping package which included a new Forest River Folding Camper and other camping accessories. Michael has recently retired from Toronto Hydro, and he and the family have been looking for an RV… they have been attending the Toronto RV Show for the past few years to shop for the RV of their dreams – this lucky win came at the perfect time for them as they begin their RV adventure! The trailer will see quite a bit of use this summer, as Colm and his friends will be using it to attend baseball tournaments, and Michael and Anne are planning a trip to Eastern Canada. 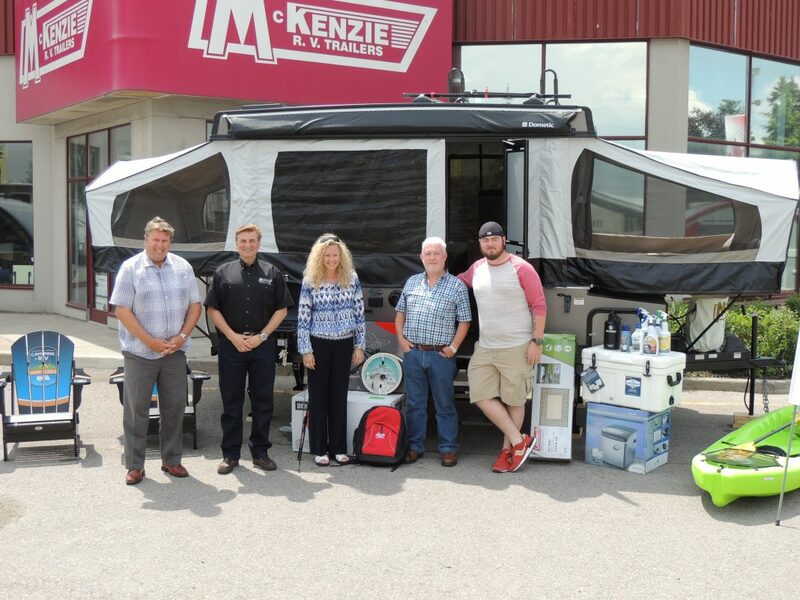 The Grand Prize package was presented at McKenzie RV Trailers in Gormley, Ontario. The Toronto Spring Camping & RV Show and Sale is the largest consumer RV Show in Canada and is held annually at The International Centre in Mississauga. The 2017 Toronto Spring Camping & RV Show is scheduled for March 2-5, 2017. RV PRODUCTS – New Gear!